A farmdoc daily article last week (January 16, 2019) examined the available data on E85 usage to see if it was negatively impacted by the SRE-driven crash in D6 ethanol RIN prices. Surprisingly, each of the three series available in the public domain on E85 use showed a consistent upward trend since December 2017, just the opposite of that predicted by the crash in D6 prices. Furthermore, all three series show double-digit increases in E85 use over December 2017 through October 2018. 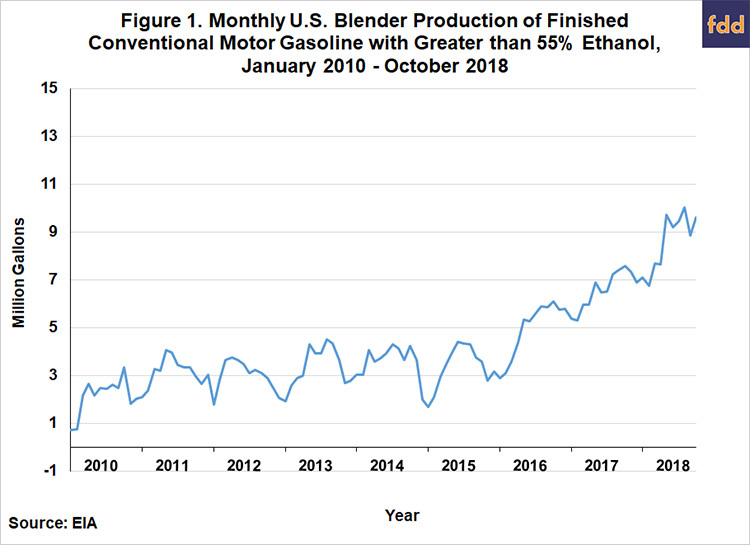 One possible factor to explain the growth in E85 used is the USDA Blender Infrastructure Program that was announced in late 2015. The purpose of this article is to investigate whether there are other factors behind the recent surge in E85 use. We begin by reviewing the series on E85 use in the U.S. from the EIA. Figure 1 shows monthly values for this measure of E85 use in the U.S. from January 2010 through October 2018. This data show a notable increase in E85 use after December 2017. In fact, according to this data series, E85 use was up 32 percent for December 2017 through October 2018 compared to the same period a year earlier. The coverage of the EIA series is probably in the range of one-third to one-half of total E85 use, as benchmarked in annual RFS rulemakings from the EPA. In the article on January 16, 2019 we also examined two other series on E85 use at the state level for Iowa and Minnesota, and they showed similar increases since December 2017. Hence, trends in E85 use across the three data series are quite consistent. Since E85 use has increased at the same time as D6 RIN prices have crashed, which are designed to incentivize consumption of higher ethanol blends, something else must have been behind the increase. Access to E85 fueling pumps is one factor that should have an important impact on E85 use. Figure 2 plots the number of gas stations in the U.S. that offer E85 pumps over 2007 through 2018. There was a 7 percent increase in E85 pumps in 2017 and another 9 percent increase in 2018, after a five-year period of lower growth in stations offering E85 pumps. The increase in access to E85 pumps in the last two years were probably due to the USDA Blender Infrastructure Program that was announced in late 2015. We suggested in the farmdoc daily article of January 16th that the positive impacts of the expansion in the number of blender pumps on E85 use overwhelmed any disincentives provided by crashing D6 ethanol RIN prices. Figure 3 provides additional perspective on the recent surge in E85 use. 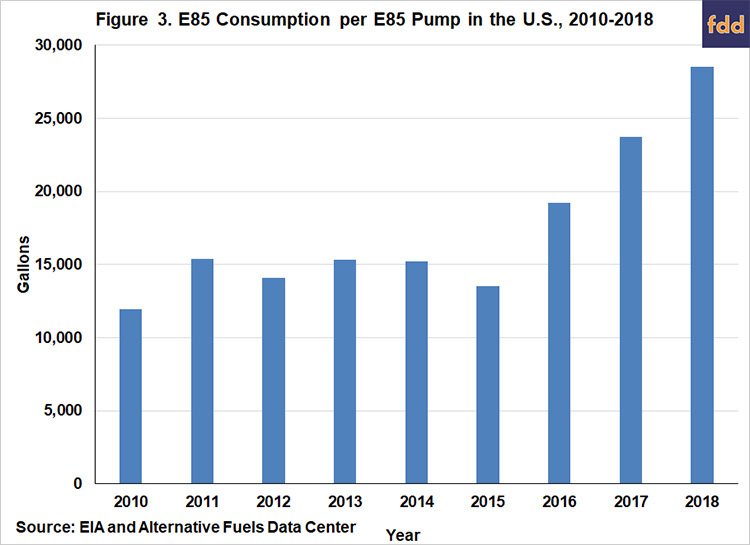 It shows E85 use per installed pump in the U.S. on an annual basis over 2007 through 2018. Total E85 usage for each year is based on the EIA series shown in Figure 2. Use for the last two months of 2018 is projected at the average monthly level during the first 10 months of 2018. 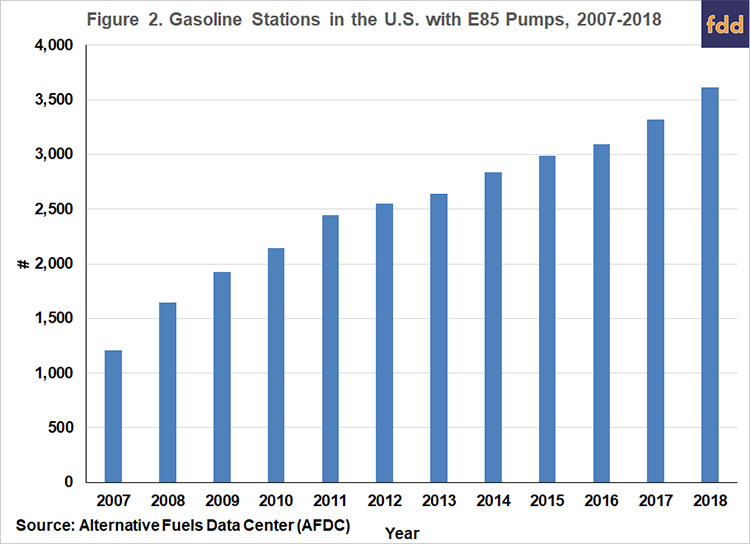 This figure indicates there was a sharp rise in E85 use per pump each year between 2016 and 2018. E85 use per pump in 2018 of 28,551 gallons was more than double the average per pump over 2007-2015. Hence, not only did the number of E85 pumps in the U.S. grow substantially over 2016-2018, but E85 volume per pump grew even more rapidly. Given that both overall E85 volume and use per pump increased since 2016, it seems likely that more factors were at work that just the incentives associated with the USDA Blender Infrastructure Program. An obvious place to look for additional incentives is the price of E85 relative to E10. There has been considerable research in the agricultural economics literature on the discount that drivers in the U.S. require in order to switch from E10 to E85 (e.g., Pouliot, Liao, and Babcock, 2018). At a minimum, it is sensible to think that drivers will demand a price discount large enough to offset the energy loss associated with E85. From a pure chemical standpoint, a gallon of ethanol has approximately two-thirds of the energy value of petroleum gasoline. Assuming E85 consists of an average of 74 percent ethanol, the price discount on E85 relative to E10 needs to be 20.5 percent to compensate for the lower miles per gallon (energy value) of E85. 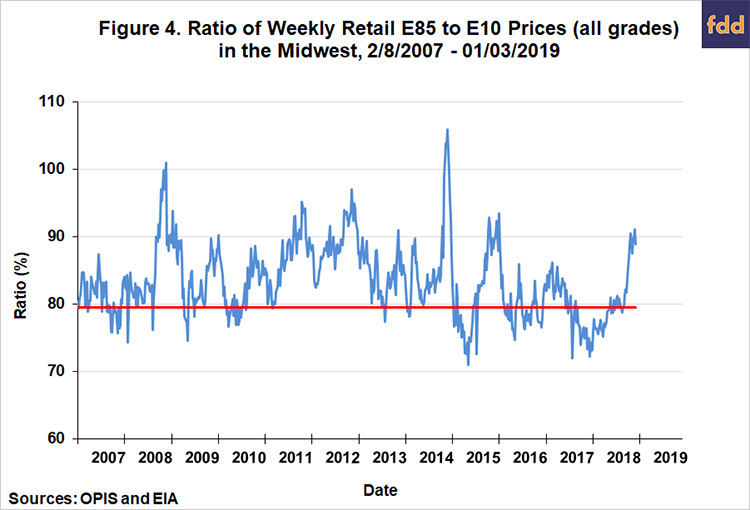 Figure 4 plots the retail price of E85 in the Midwest as a percentage of retail E10 prices over February 8, 2007 through January 3, 2019. The red line is the breakeven E85 price as a percentage of the E10 price (79.5 percent) that equates the energy value of the two fuels. The figure shows that for most of the time since 2007 the relative price of E85 exceeded the breakeven energy level, and for long stretches of time by a considerable amount. There are two notable exceptions, the first is a 6-month period in 2015 and the second is a 10-month period from August 2017 through May 2018. The latter period is of most interest for the present analysis. About half of the August 2017-May 2018 period overlaps with the surge in E85 use apparent in Figure 1 from December 2017-October 2018. This suggests that E85 pricing played a role in stimulating the increase in E85 use in the last year. However, it should also be noted that the timing of the additional discount on E85 use does not line up all that well with the surge in E85 use. The surge in E85 use began in earnest during May 2018, just as the discount on E85 relative to the energy breakeven value disappeared. While it is certainly possible that E85 pricing has a lagged impact on use, this suggests a good deal of caution in assigning causality to any single factor when attempting to explain changes in E85 use. E85 use in the U.S. has increased nicely in the last year. This is puzzling since the price of D6 ethanol RINs crashed during the same time period, and D6 RINs are supposed to incentivize the consumption of higher ethanol blends. One factor that may have offset the disincentive of crashing D6 prices is increased access to E85 pumps associated with the USDA’s Blender Infrastructure Program. However, both the number of E85 pumps and the volume per E85 pump has increased notably since 2016. This suggests additional factors are at work. The pricing of E85 is an obvious candidate and the analysis in this article shows that the discount on E85 relative to E10 did increase markedly for the 10-month period between August 2017 and May 2018. While this in all likelihood helped to stimulate E85 demand, the timing of the increased discounts did not line up perfectly with the surge in E85 use. This suggests no single factor is responsible for the recent surge in E85 usage.